Price Range: $10 or less1: Poor 2: OK 3: Good 4: Very good 5: Excellent 6: Tres Excellent!! Store bought guacamole/sauces…apparently I am wrong, it IS all made in house! For me it wasn’t as obvious, but I’m glad to hear all of it is made in house. 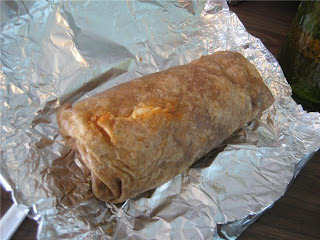 **Recommendation: Johnny – O Burrito (I didn’t try it, but it’s the most popular choice). Everyone orders burritos here. I wouldn’t re-order the things I tried because they weren’t that good. For what it is – a hole in the wall eatery on Kingsway, Budgie’s is not bad, but not great either. I think it’s popular because it’s cheap and filling, but the food is actually not great. Really casual, get your own water, order and pay at cashier, seat yourself kind of eatery. I was expecting more because it’s quite busy and I always hear people raving about how big the burritos are. Yes they do put quite a bit of stuffing, but it’s definitely not something you can’t replicate at home. Open a can of beans, over cook your rice a bit, grate some cheese, buy some store bought guacamole etc…and that’s pretty much Budgie’s, nothing special – just a fat vegetarian burrito. Everything was actually lacking in flavour and too mushy – my wrap broke because the sauces and everything made the burrito too wet. Just by looking at the pictures you can tell how mushy it was. I couldn’t pick it up cause the sauces would leak out the bottom. Sometimes this can actually be good, but because the sauces are bland – it wasn’t. I may go again, but out of convenience…hands down The Foundation (also vegetarian) just down the street is better. 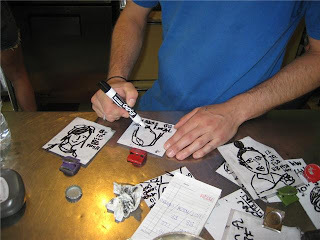 The staff was pretty cool though – instead of writing our names with our orders they were drawing pictures of us…just for that day though. This sounds like it would be really flavourful and spicy or smoky – but it wasn’t any of the above. I needed to add Tobasco (available at the table) before every bite to give it flavour. It was good that way, I barely ever use Tobasco sauce unless something really needs flavour too. The tofu was the firm kind which gave the burrito texture and heartiness…otherwise I would have felt like I was eating a lot of mush. Don’t get this. It really isn’t good. The tofurkey tasted like cardboard and I almost took it out. It kind of looks like cardboard too (see picture) – it tastes pretty bad. I’ve had good tofu sausage before, but this was a really poor quality one…not sure what brand they’re using, but they should really opt for something else. Has a weird after taste…needed lots of Tobasco…partly to add flavour and partly to mask the tofurkey taste. I would just like you to know that all of the ingredients are made fresh from scratch everyday. This includes the guacamole and all of the salsas. We use Tofurky brand kielbasa sausage. Look them up, they are the best brand out there. Sorry you didn't like your meal, but please know all of your facts before dedicating so much time to reviews. Hi Macey! Thanks for your comment and thank you for clarifying things. 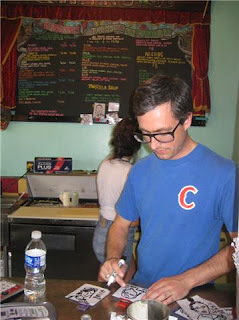 I am pleased to know that all guacamole and salsas are made in house and I will correct that in my review. I think they could use more seasonings though to give the burritos more flavour. It wasn't the whole meal I didn't enjoy…I just didn't like the Tofurkey…it could be the best brand, but for me…it just didn't work. Please know that I do dedicate a lot of time for my reviews and everything written is my personal opinion. Hi Macey, would you kindly consider changing your "Henry Burrito" to something else? Please…! because my name is Henry and I don't want to be a non tasty burrito. Thanks! 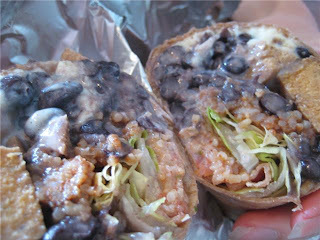 and are those blueberries in the burrito?! personally i absolutely love the henry burrito! with big huge chunks of tofurkey sausage! 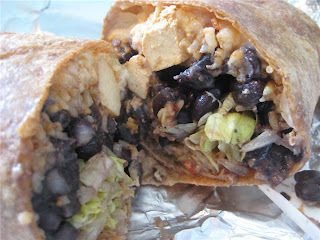 obviously as a meat replacement it wont be as good to a meat eater but as a vegetarian it sometimse seem so meatlike that i feel bad…as far as vegetarian burrito joints go…budgies wins. Hi Amanda – Interesting thoughts and thanks for your comment. I would just rather have tofu instead of this tofurkey. So coming from a vegetarian, do you think the tofurkey was the best imitation meat you’ve tried? I guess your not a fan of anything that tastes like meat so is it the taste or texture that is too meaty for you? I want to assume texture because the taste I thought was far from. I’m not a vegetarian but I do eat tofu and vegetarian meats at times and enjoy them… so I was just very dissappointed by this tofurkey. Follow Me Foodie to National Peanut Butter Day! There’s a National Peanut Butter Day? Um, you mean you didn’t know? Follow Me Foodie to Everything & Anything Peanut Butter! Here are some must try peanut butter dishes in Vancouver, BC & abroad. Peanut butter lovers unite!